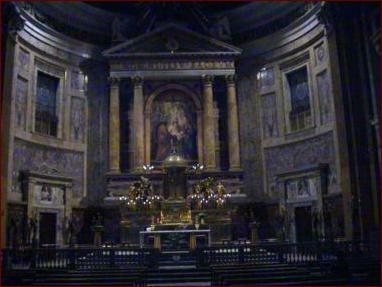 The Chiesa del Gesu, closer to the Corso Vittorio Emmanuele than the Piazza Venezia, is one of the best examples of baroque churches in Roma. It's the home church of the Society of Jesuits. We visit it on our way back from the Vittorie. My video camera doesn't have a flash and its low-level compensation capabilities only go so far. 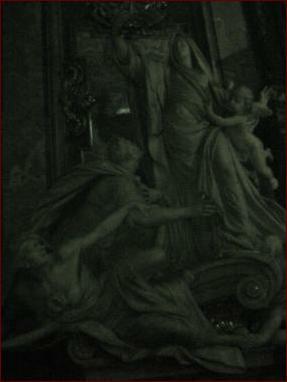 I apologize for the darkness of this image of a statue entitled The Victory of Faith Over (Something). 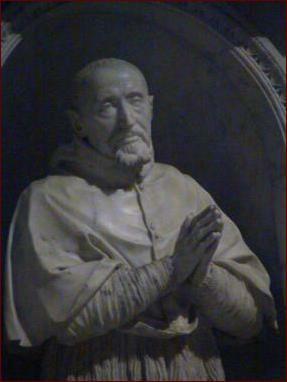 I was rather taken by facial expression on the carved statue of Saint Robertus Cardinal Bellarmino, Society of Jesuits.